Makin' Waves is definitely a fun summertime jam song with a clever hook about love. Zac's music is described as real country with a slightly modern flare based on real life experiences that anyone could relate to. Songs of love are his bread and butter. 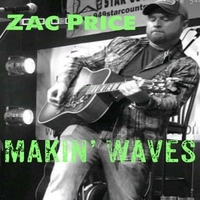 Makin' Waves is a first for Zac as his previous songs were slower paced. Makin' Waves is sure to rock your socks off and be a real summertime hit.